Revolver Magazine has teamed up with Line 6 to do a giveaway. 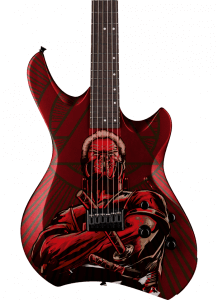 One person will win a brand new Shuriken Variax guitar. To enter, you must sign up for the Revolver newsletter. At the time I am writing this, there are 12 days left to enter. Shuriken Variax guitars resulted from a collaboration between Shuriken Guitars, Line 6 and Yamaha Guitar Development. They are modern, high-quality instruments featuring unique body shapes with contoured edges, Indian ebony fretboards, custom mid-gain humbucking pickups, and all of the sonic versatility provided by Variax HD technology. One winner will receive 1 Shuriken Variax guitar from Line 6 and a one-year subscription to Revolver magazine. No purchase or payment of any kind is necessary to enter or win this sweepstakes. As always, it is a good idea to read the Terms & Conditions of any contest, giveaway, or sweepstakes. The sweepstakes ends on September 23, 2018, at 11:59pm PST. This sweepstakes is only open to legal residents of the 50 United States and the District of Columbia who are 18 years of age or older. Residents in Alabama and Nebraska must be 19 years of age or older. Entrants must supply their full name, email address and zip code and join Revolver’s email newsletter. Entrants may also share the contest to earn additional entries (but this is not required to enter). One winner will be selected by random drawing on or about September 24, 2018, from all eligible entries received during the sweepstakes period. No cash or prize substitution is allowed. Prize is not transferrable. This promotion is not sponsored, endorsed, or administered by, or associated with, Facebook or Instagram. 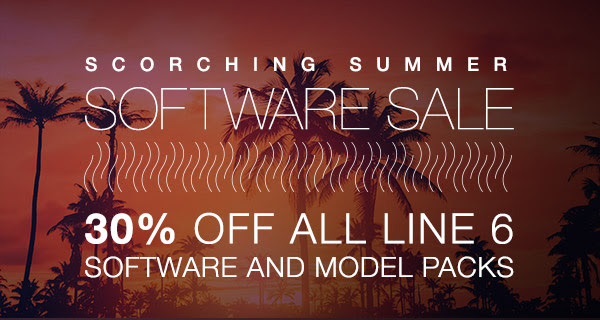 Line 6 is having a Scorching Summer Software Sale where you save 30% off all Software and Model Packs if you use the coupon code “SUMMER30”. This is a worldwide promotion and a limited time offer that ends on July 31, 2018. 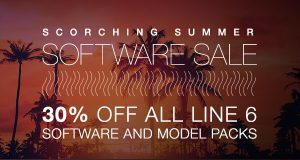 For a very short time, get 30% off all software items in the Line 6 online store including Helix Native, POD Farm software, Model Packs, and Echo Farm. Helix Native offers the authentic sounds of vintage and modern amps, cabs, mics, and effects – plus extensive signal routing functionality and an easy-to-use interface. Whether you’re a guitarist, producer, engineer, sound designer, film/TV/game composer, or electronic musician, the Helix Native plug-in is perfect for creating new and original sounds. POD Farm 2.5 is a premier guitar tone plug-in that features vintage and modern amps, cabs, classic stompboxes, colorful preamps, and more. 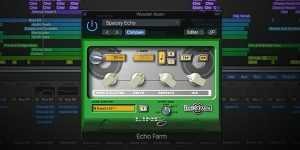 Echo Farm 3.0 is a 64-bit native plug-in for any DAW. Bring a legendary collection of vintage delay and echo effects to your studio with Echo Farm 3.0. Now supporting 64-bit AU and VST plug-in formats in addition to AAX, Echo Farm works with any DAW. Echo Farm 3.0 features models based on vintage hardware units such as the Roland RE-101, Space Echo, Boss DM-2, Electro-Harmonix Memory Man, TC Electronic 2290, and Maestro Echoplexes, plus Line 6 originals. This offer is available to Line 6 customers worldwide. The offer applies to all Model Packs and Software on store.line6.com. All products must be purchased from store.line6.com. Applicable tax, if any, is the sole responsibility of the customer. 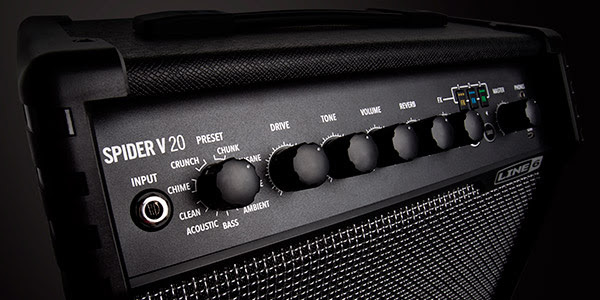 Line 6 has introduced the Spider V 20. It is the ideal practice amp for any guitarist. The compact Spider V 20 amp offers great sounds right out of the box, as well as easy-to-use controls for dialing in your own tones. Spider V 20 is a 20-watt amp with an 8” speaker featuring 16 onboard presets, 3 simultaneous effects, and an independent reverb. The Spider V 20 amp sounds great right out of the box. Whether playing though one of the 16-tonally diverse presets, or dialing in personalized tones with the easy-to-use controls, Spider V 20 is the ideal practice amp for any guitarist. 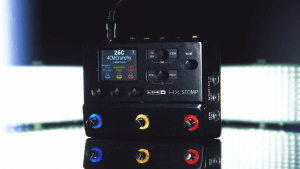 Each preset contains three effects that can be switched in and out stomp-box using the dedicated FX buttons on the front panel, and turning the independent Reverb knob adds atmosphere and depth to your sound. Tap in delay times and effect modulation rates with the Tap/Tuner button, or press and hold it to access the onboard turner. A micro USB port makes it easy to connect the Spider V 20 to your Mac, or PC, or iOS and Android device, where you can edit your tones via the free Spider V Remote app, or record your performances with the included Steinberg Cubase LE DAW. Line 6 has introduced the newest member of the Shuriken Variax Family – the Shuriken Variax SR250 guitar. The SR250 features the same unique body shape and Variax HD technology as the longer-scale SR270, with a traditional 25.5” scale length. Shuriken Variax guitars resulted from a collaboration between Shuriken Guitars, Line 6, and Yamaha Guitar Development. They are modern, high-quality instruments featuring unique body shapes and contoured edges, Indian ebony fretboards, custom mid-gain humbucking pickups, and all of the sonic versatility provided by Variax HD technology. Shuriken Variax guitars come with a Shuriken premium padded gig bag. Shuriken Variax guitars are available in two scale lengths. The Shuriken Variax SR270 features a longer 27” scale length that will feel familiar to many players using lower tunings, while the Shuriken Variax SR250 features a traditional 25.5” scale length. Line6 has introduced Powercab 112 and Powercab 112 Plus speakers. They are active guitar speaker systems for modelers. Powercabs are also loud enough to fill any small club or medium-sized venue, and performing guitarists will also appreciate their lightweight yet roadworthy construction, compact size, flip-out kickstands, and XLR direct outputs. 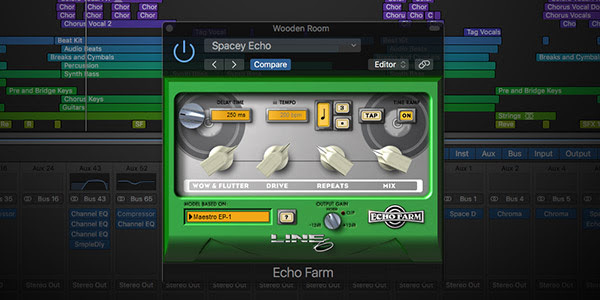 Line 6 announced that Echo Farm 3.0 now works with all popular DAWs. Bring legendary delays and echo effects to your sessions! Supporting Audio Units and VST in addition to AAX Native, Echo Farm 3.0 now works with all popular DAWs. Bring classing echo sounds to any project with 64-bit native performance and support for sample rates up to 192 kHz. Pro Tools users will appreciate full backward compatibility and the ability to open old sessions without losing previous sounds or settings. Echo Farm 3.0 features models based on vintage hardware units such as the Roland RE-101, Space Echo, Boss DM-2, Electro-Harmonix Memory Man, TC Electronic 2290 and Maestro Echoplexes, plus Line 6 originals. Settings and presets are 100% compatible with Pro Tools TDM sessions (AAX version only). You can listen to 10 different audio samples on the Line 6 website. Echo Farm 3.0 is available for download via the Line 6 online store. Line 6 introduced the world’s first digital modeling amp. Their Variax guitars can do more than any other instrument in history. Line 6 is giving away a free gig bag – for a limited time. To enter, you must purchase a Firehawk 1500 amp. 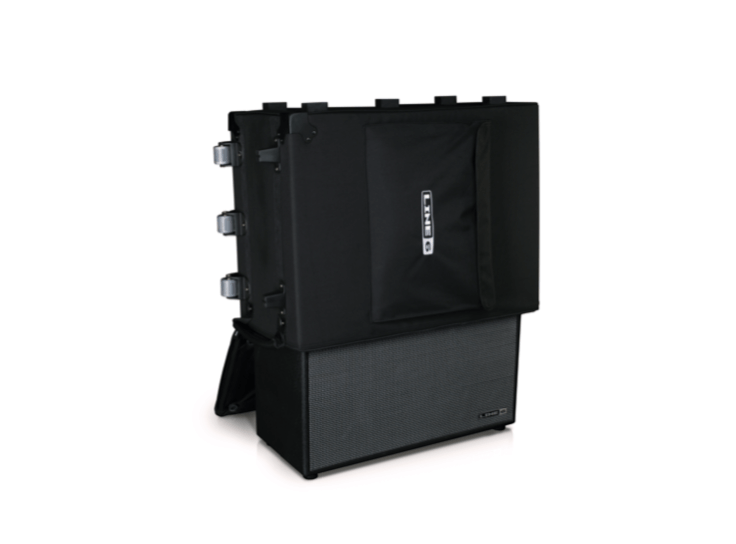 Easily transport and protect your Firehawk 1500 stage amp with this custom speaker bag! The Firehawk 1500 Speaker bag is a heavy duty amp road case with built-in wheels, pull-up handle, and padding, to make traveling to your next gig a breeze! The giveaway started on March 1, 2018, and will end on April 30, 2018. To be eligible, you must purchase a Firehawk Amplifier. The speaker bag is a $199.99 value. There are terms and conditions to be aware of. Eligible products must be purchased as new from an authorized reseller in the United States. This offer is not available for remanufactured, demonstration, or non-new products. Purchases made from online auctions are not eligible. Line 6 does not allow product substitutions, deletions, additions, or other modifications to this offer, regardless of information you learn from other sources. The offer is available while supplies last. Sales tax (if any) is the responsibility of the consumer. You must upload an image of your original receipt(s) as part of the registration process. 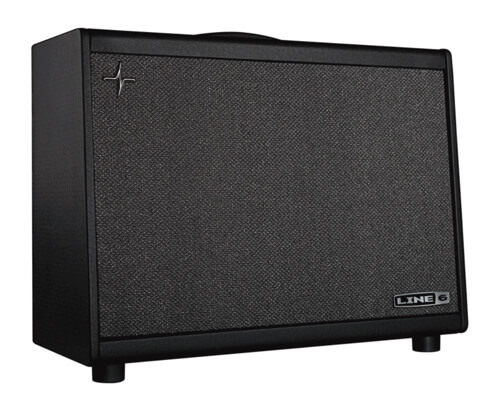 The Line 6 Firehawk 1500 is the ultimate stage amp. It features plenty of power and a unique full-range speaker configuration that delivers consistent tone at any volume. It’s a next-generation stage amp for guitarists who want great live tone – on any stage, and at any volume. Line6 is offering a free Helix Backpack for a limited time. In order to receive the free backpack, you must purchase a Helix Floor or Helix LT Guitar Processor. This promo is offered in the United States, only. The Helix Backpack is a rugged, go-anywhere custom-designed carrying case made especially for the Helix floor processor. The same care and attention to detail that went into the design of the Helix floor processor is reflected in the backpack. From its luggage-grade construction and closed-cell foam padding to its rugged, molded rubber carrying handles and water-resistant zippers, the Helix Backpack will protect your gear for years to come. 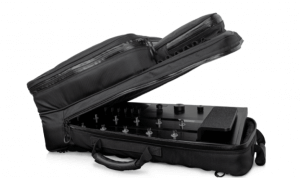 For the ultimate in convenience, the Helix Backpack provides ample room for additional items such as sheet music, cables, small pedals, power supplies, and other accessories. This offer started on March 1, 2018, and will end on March 31, 2018. Eligible purchases include a Helix floor or a Helix LT guitar processor. The Helix Backpack is a $149.99 value. Eligible products must be purchased as new from an authorized reseller in the United States. The offer is not available for remanufactured, demonstration, or non-new products. Purchases from online are not eligible. The Helix Floor is one of the flagship guitar processors of the Helix family, offering incredible power, flexibility, and control. The Helix LT guitar processor delivers the highest levels of performance, flexibility, and control in its class. It also makes an ideal backup processor for Helix Floor and Helix Rack owners. Line 6 is holding a Guitar Ninja Video Contest. It is being held to celebrate the 15th Anniversary of Variax guitars. Capture your creative guitar playing on video, and enter to win a hand-painted Shuriken. Join us in celebrating the 15th Anniversary of Variax guitars! Enter the Guitar Ninja Contest by showcasing your musical creativity to win a one-of-a-kind Shuriken Outlier guitar hand-painted by Pamelina H., featuring graphics based on Twelve Foot Ninja’s Outlier album artwork. 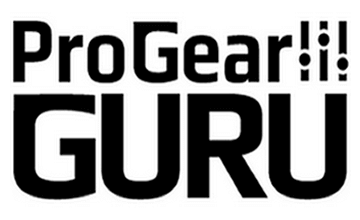 The final deadline for entering the Guitar Ninja Video Contest is January 7, 2017. The winner of the contest will be selected by Stevic MacKay from Twelve Foot Ninja. This contest is open to U.S. residents, only. Record yourself playing innovative guitar. Original music only. No cover songs. Post your video on YouTube. Fill out the form on the contest website with a link to your video. Tell all of your guitar playing friends to do the same. 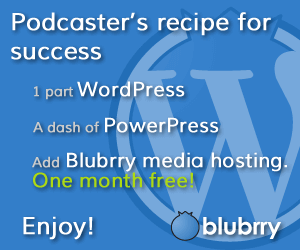 Your video can be a maximum of 60 seconds. You must be at least 18 years of age to enter the contest. All entries must comply with YouTube’s Community Guidelines. Entries that do not comply will be disqualified. Entering the contest grants Line 6 a license to publish and re-use your video for any purpose and without compensation. Finalists will be determined by Line 6 staff and Steve “Stevic” McKay will select the winner.